I loved to sit by the tree and play with the angel in the middle with her pink gingham dress imagining a story for her. I cannot remember any of those daydreams, but I know the elf was involved. Not the gold angel, she was too perfect to play with. When Mum was downsizing her Christmas decorations because she no longer puts up a big tree. These are the three I insisted on having. And they are on my tree today. Well, except the gold angel whose loop broke while I tried to put her on the tree, so she'll stand next to Santa and at some point go into the "workshop" (aka my art room, where I've taken care of a tiny elf and one of the three kings so far this year) for repair as soon as I figure out how as the loop goes into her head. Hmm. The poor elf has already had its loop replaced, has a dented face, and my pink gingham angel has lost a foot, but they will never ever be downsized by me. Do you have a favorite Christmas decoration? If so, what is it? I'm joining in Claudia's A Favorite Thing over at Mockingbird Cottage. Be sure to check out the others. I love these little ornaments. My husband had some of his old ornments...and they are very similar. We decorate a tiny tree with them. Childhood decorations are the best! I have quite a few I'm happy to say! These little ornaments are so sweet. I love that you have kept them from your childhood and continue to treasure them. 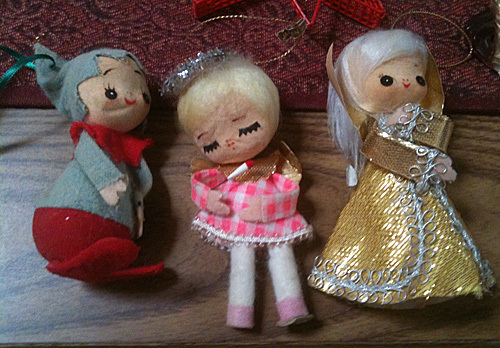 Some of my favorite ornaments are the ones that i've had since I was a wee tiny little girl, and they have hung on my tree every year since. A little bell from breakfast with santa many years ago, a tiny green tulle angel, an itty bitty gold chenille duck , a paper star from my Grandparents. Other favorites are the ones my children made when they were young... a fish made with popsicle sticks and pink feathers, beaded dinosaurs.... the ornaments bring back memories of special people and times in our lives and I know I am blessed. They are so sweet and how wonderful to have vivid memories attached to them. I have a few on my tree too, and others in the china cupboard. Thank heaven for mothers that saved things for us! Christmas blessings. What adorable little ornaments. Wonderful treasures from your past. These are so precious! We all remember our favorite childhood ornaments with such fondness. How wonderful that you now have these in your home. What sweet memories. They are all so cute!